ST. CHARLES, Mo.—Using mysterious powers rivaling a GPS, they navigate a landscape more vast than the span of the continental United States. With instinct alone as their guide and in perfect sync, thousands journey through the air each autumn to one particular mountain range in Mexico. It’s a specific roosting site custom-made for their needs. They’re not birds, but Monarch butterflies. The showy, familiar orange and black Monarch butterflies are the only insects that make this amazing migration. This incredible odyssey goes right through Missouri. 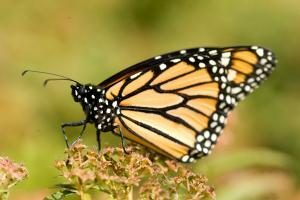 The Missouri Department of Conservation (MDC) along with the U.S. Department of Energy (DOE) and a host of other partners are celebrating the monarch migration with a special event in the St. Louis area. Monarch Madness takes place Saturday, Sept. 9 from 10 a.m.—3 p.m. at the DOE Weldon Spring Site Interpretive Center in St. Charles. The event is free and open to all ages. Though monarchs are the front liners, the Monarch Madness event will celebrate all pollinating creatures that help our plants thrive. The event will offer an interactive and fun way to learn about pollinator declines and what people can do to help. The event will also feature kids’ crafts, games, exhibits, native garden demonstrations, butterfly tagging, food trucks, music, and more. Visitors can purchase native plants and collect free seeds in ready-to-plant packages to grow monarch-sustaining plants at home. Guests can also enjoy viewing and hiking the site’s 150-acre restored Howell Prairie. 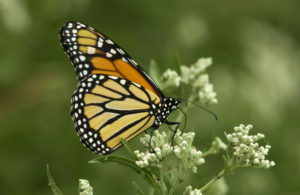 As monarchs flit from plant to plant in search of food, they spread pollen crucial to the reproduction of their host plants. More than 75 percent of the Earth’s flowering plants depend on pollinators. It’s a relationship vital to the survival of each—and us. One out of every three bites of food we eat exists because of pollinating insects. Pollinator decline in the recent past is a source of growing concern among scientists. It’s estimated that in the last 20 years, Monarch populations have plummited more than 80%. Dwindling habitat for these colorful butterflies is believed to be the source of the drop. Though the numbers for monarchs may seem grim, people can do something to help. Planting backyard butterfly gardens can help monarch populations recover. Establishing milkweed and nectar plants will also give them a boost on their long journey. Monarch Madness will help visitors learn how they can make a difference. For more information, go to https://goo.gl/C8imS5. The Monarch Madness Event celebrates these colorful butterflies and other pollinators with a day of fun and interactive activities—including butterfly tagging and releases. It takes place Saturday, Sept. 9 from 10 a.m.—3 p.m. at the DOE Weldon Spring Site Interpretive Center in St. Charles. I simply want to say I am just new to blogging and site-building and absolutely enjoyed you’re web-site. Almost certainly I’m planning to bookmark your blog . You absolutely have very good articles. Bless you for sharing your webpage. What is a good totally free blogging website that I can reply to blog sites as well as others will react to me? I am very new to web design as I have no prior experience as well as understand little HTML. I just want to know what the best software is to buy to make blogs. I have downloaded CS5 Design Premium with Dreamweaver as well as Photoshop, however I realize this is a little advanced for me and costly!!!. Does any individual have tips of software program or methods to develop blog sites and sites quickly and also economical?. THANKS!.